Da Capo Press, 9780306823718, 352pp. 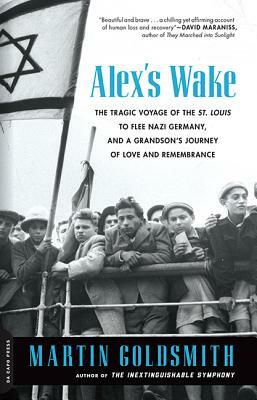 Alex's Wake is a tale of two parallel journeys undertaken seven decades apart. In the spring of 1939, Alex and Helmut Goldschmidt were two of more than 900 Jewish refugees fleeing Nazi Germany aboard the St. Louis, the saddest ship afloat” (New York Times). Turned away from Cuba, the United States, and Canada, the St. Louis returned to Europe, a stark symbol of the world's indifference to the gathering Holocaust. The Goldschmidts disembarked in France, where they spent the next three years in six different camps before being shipped to their deaths in Auschwitz. Martin Goldsmith is a host and classical music programmer for Symphony Hall on Sirius XM Satellite Radio and previously hosted NPR's daily classical music program, Performance Today, from 1989 to 1999. He is the author of The Inextinguishable Symphony and lives in Maryland.